Happy birthday Jan Pienkowski (Little Monsters, Haunted House), Candy Dawson Boyd (Daddy, Daddy, Be There; Forever Friends). In 1945 The United Nations Charter is signed by the United States, the third nation to join. Read We Are All Born Free: The Universal Declaration of Human Rights in Pictures by Amnesty International. In 1974, U.S. President Richard Nixon announces his resignation. Read The Watergate Scandal by Kathleen Tracy. It’s Sneak Some Zucchini Onto Your Neighbor’s Porch Day/Night. Read Zucchini by Barbara Dana, illustrated by Eileen Christelow, The Accidental Zucchini: An Unexpected Alphabet by Max Grover, and I Heard It From Alice Zucchini: Poems About the Garden by Juanita Havill, illustrated by Christine Davenier. It’s also Happiness Happens Day. Read The Garden of Happiness by Erika Tamar, illustrated by Barbara Lambase, The Wonderful Happens by Cynthia Rylant, illustrated by Coco Dowley, Happy Birthday, Little Pookie by Sandra Boynton. Today we celebrate the birthday of a writer who had no intention of crafting a book for children—nor was her classic published as one. Marjorie Kinnan Rawlings’s The Yearling appeared on the Scribner adult list in 1938. 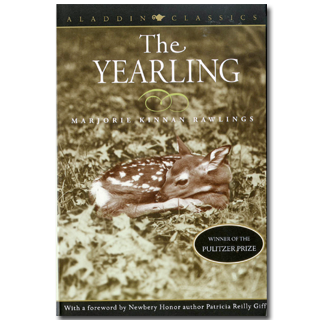 Edited by the legendary Maxwell Perkins, who also worked with Hemingway, Fitzgerald, and Thomas Wolfe, The Yearling became the bestselling adult title in 1939 and also won the Pulitzer Prize. A year later, an exquisitely illustrated edition with art by N.C. Wyeth helped shift the readership of the book—it became a staple of family reading, ideal to share with ten- to fourteen-year-olds. Hence this adult bestseller became a children’s book classic, one loved by adults and children alike. To create the book, Rawlings drew on the history, flora, and fauna of North Florida, where she moved after leaving her husband. She learned that in 1876 Reuben and Sara Long set up a homestead on Pat’s Island, now part of the Ocala National Forest. Their son Melvin found and adopted a fawn. Rawlings incorporated the actual setting of this homestead and a few facts about the Longs into her famous book. If by any chance you are headed to North Florida, you can actually visit the remains of the homestead and the setting of the book. Otherwise, you can go there simply by reading. Happy birthday, Marjorie Kinnan Rawlings. She created such a great book for children, even though she never intended to do so. He skirted the carcass and parted the grass at the place where he had seen the fawn. It did not seem possible that it was only yesterday. The fawn was not there. He circled the clearing. There was no sound, no sign. The buzzards clacked their wings, impatient to return to their business. He returned to the spot where the fawn had emerged and dropped to all fours, studying the sand and the small hoof-prints. The night’s rain had washed away all tracks except those of cat and buzzards. But the cat-sign had not been made in this direction. Under a scrub palmetto he was able to make out a track, pointed and dainty as the mark of a ground-dove. He crawled past the palmetto. Movement directly in front of him startled him so that he tumbled backward. The fawn lifted its face to his. It turned its head with a wide, wondering motion and shook him through with the stare of its liquid eyes. It was quivering. It made no effort to rise or run. Jody could not trust himself to move. Originally posted August 8, 2011. Updated for . Anita, your readers might also enjoy the wonderful movie made from Rawlings’ memoir. CROSS CREEK has an outstanding cast and is beautifully done. Might watch it again myself! Leda: Thanks for the reminder; of course the book would also be of interest to Rawlings fans. ooh, another classic that for whatever reason I never picked up. The Maxwell Perkins stories are fascinating. He seems like he was quite a character. I loved this book as a young teen, and have read it aloud several times since then, to students and to my own children. A wonderful book to get lost in. I’m not at all surprised to see Lois Lowry’s name come up in today’s entry. The Yearling comes up again and again in her writing and in her musings about her writing — the power of that story clearly informed her work in so many meaningful ways. Thanks for mentioning both of these important storytellers in today’s Almanac – it’s always nice to remember the power of a well-told story — for adults and kids– and the magic of our language. This is one of the two books I remember my dad reading to my sister and I when we were children. I treasure the same copy we read together and hope to share it one day with children in my family. A wonderful post. I’ve linked it & updated my April blog on Cross Creek, one of my favorite pilgrimages. And to the post above, the movie version is wonderful. The Yearling led me to all the other books Marjorie Kinnan Rawlings wrote. What a treat! We visited her home, preserved in Florida. Saw her typewriter. Someone had put together a scrapbook of news clippings. I read a comment a critic somewhere had written–“She was a good writer, not a great one.” I beg to differ!!!!!! There is also a lovely movie of The Yearling–Gregory Peck, Jane Wyman, Claude Jarman, Jr.